Chances are that you have never heard about Wow Air or its founder Skuli Mogensen. But now is the time to stand up and take notice. Mogensen is famous for saying that a day will come when airlines will pay their passengers to fly. His airline is not exactly doing that, but it’s offering a deal that’s unheard of in the aviation world. In December, Wow will launch the cheapest return flight from India to East Coast (US) at Rs 27,000 - this is less than half of the next cheapest flight. “If you find a cheaper flight than this, I will pay the difference,” Mogensen has said. The Iceland-based airline, one of the leading players in the burgeoning low cost long haul market, plans to exploit Ireland’s favourable geographical location and connect national capital Delhi via its hub in Reykjavik to 14 North American and multiple European destinations including New York, Los Angeles, Chicago, Montreal, Toronto. A Wow Air flight will take off from Delhi early morning; take about 11 hours to reach Reykjavic and another six hours to Washington after a two and a half hour layover, posing a fierce challenge to Gulf airlines which have wrestled a major share of India’s West-bound traffic with cheaper fare and convenient onward connecting flights via Dubai, Abu Dhabi. “If you look at flights from India to North America, they fly directly above Iceland which means our hub at Reykjavik has a superior connecting time than Dubai or Amsterdam. 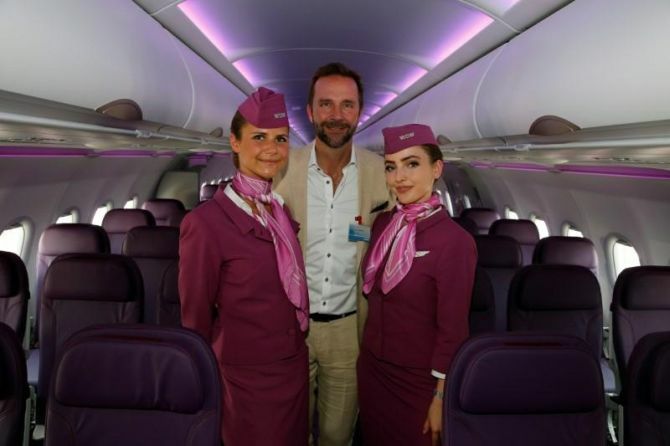 "We will provide the fastest connecting flight, our aim is to make Iceland the Dubai of North,” says Mogensen. However, there’s a catch. The low fares will come with a discernible sea-change in service quality and minus the luxury which comes as an essential part of any long-haul travel. So, any food or drink will come at a price. A cup of coffee or tea can be bought for $2.71 and a medium-sized chicken sandwich for $10.49. Also, Wow flyers will have to travel really light as for anything beside one piece of small carry-on bag the airline will charge you extra. The aircraft will be more densely packed with 365 seats, implying less legspace. “Our target segment is a customer for whom it is not acceptable to waste money,” Mogensen said. “I would say that such airlines always open up a totally new segment of market. Look at Air Deccan or IndiGo--they created a complete new segment of travellers. "Similarly, the traditional Indian flyer to USA may stick with the established carriers but in a country as large as India, this will have takers who may be taking a tougher flight so that they can spend doing some extra things on their holiday,” said Manoj Chacko, chief executive of SOTC Business Travel.